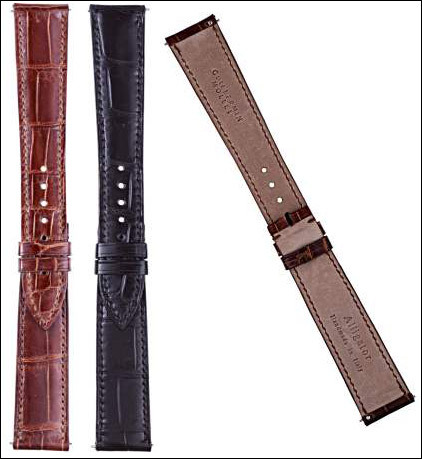 Each Guillermin Mollet watch is fitted with a high-grade alligator strap. 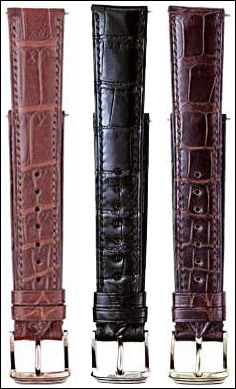 The strap is hand made in Italy using the finest Louisiana farm bred alligator skins. Each strap is custom finished with French cut edges and hand stitched. The straps are offered in Black, Dark Brown and Rust colors and are available in a gloss or matte finish. The strap is fitted with a hand made 18kt. gold buckle designed to repeat the fluting of the case. Buckles are hallmarked and available in yellow, rose or white gold.